This past summer we built a “new” greenhouse on to the side of the Rev. Searle’s farm barn. It is modeled somewhat on the greenhouse at Zoar Village, which was established in 1817 by German Separatists. Newest addition to our buildings. This week we were given the Darrowville Post Office. Darrowville was a small town located between Hudson and Stow, in Summit Co. Here is a small peek into the wonderful work done by our favorite photographer, Arlan Heiser, as he catalogued the collections, buildings, scenes and work around the museum. 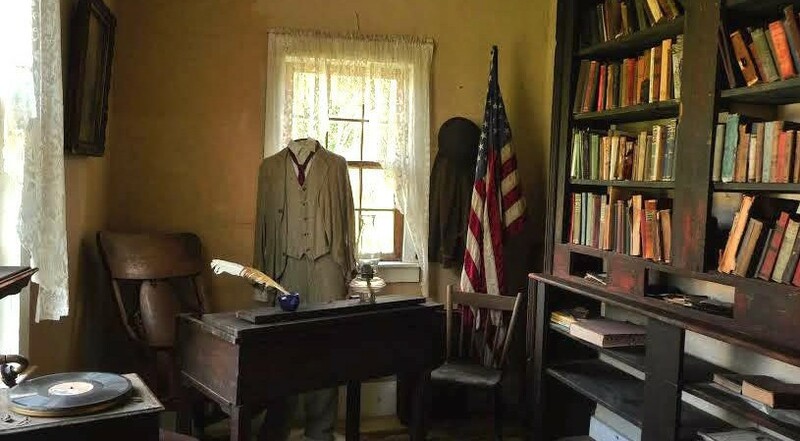 Photo by Laura Fry http://www.heritagehomesteadclasses.blogspot.com/ The preservation of the buildings and artifacts of history is important, but…..
Ray Sapsford standing at rear of “KNOPP” HOUSE.. A major goal for the museum is to save, protect and restore fast disappearing Northern Ohio history. The Fryburg Telegraph office is located in the Randolph Post Office building. _____________________________ …It’s been considerable work getting this building back in shape. The museum has just acquired a 1934 REO Fire Truck. It’s been a busy month at the museum. This is a building that never should have been moved. Mike Hotz and a friend came to Richfield in 1878. They went to work at Killiffer’s Blacksmith Shop. Some years later Mike built his own shop. …That was later to cause some confusion for various of Richfield’s officialdom. Photos by Arlan Heiser John Casto was the head printer at Firestone Tire & Rubber Co. in Akron. Photo by Arlan Heiser (Picture taken with infrared camera.) The last murder committed in Summit Co. for which the perpetrator was hung, was done in the Highjack House. _________________ Visible in the exterior picture is the “Karesec green” building paint used on the trim of all their farm buildings. I received a call from one of the local golf courses. It was time to move the outhouse that had been standing for years near one of the greens. The Rev. Searles was the preacherman at the Hinckley Baptist Church quite some years ago. He lived just down the road from the church. Behind his home is what may be one of the oldest barns in Ohio. Blacksmith shop before move. (Photo: Arlan Heiser, photo curator) December of 2009 we were selling Christmas trees, just as we have since 1963. A gentleman came into the Gen’l Store and asked about the museum. The Lloyd Davis Barn (Lloyd was Buzzy and Roy Davis’s uncle) is finished and an addition was added in the spring of ’09. This is an interesting building. Almost nothing is known about its original use, or its original name. Post Office under restoration Moving day. Building arrives from Randolph. (Photos by Arlan Heiser, photo curator) I had a lucky accident happen last spring (March 2010). (Shown in picture, Ward Cox and school house neighbors.) The school house was moved here and restored in the summer of ’08.